One of Vermont’s greatest treasures, Lake Champlain provides recreation, solitude, and beauty for thousands of visitors and locals each year. It’s 125 miles long, with more than 587 miles of shoreline. Lake Champlain is also home to 318 species of birds, 81 fish species, and a mysterious monster, affectionately known as Champ. At it’s widest point, near Burlington, Lake Champlain is almost 12 miles long, but it narrows significantly on either end. 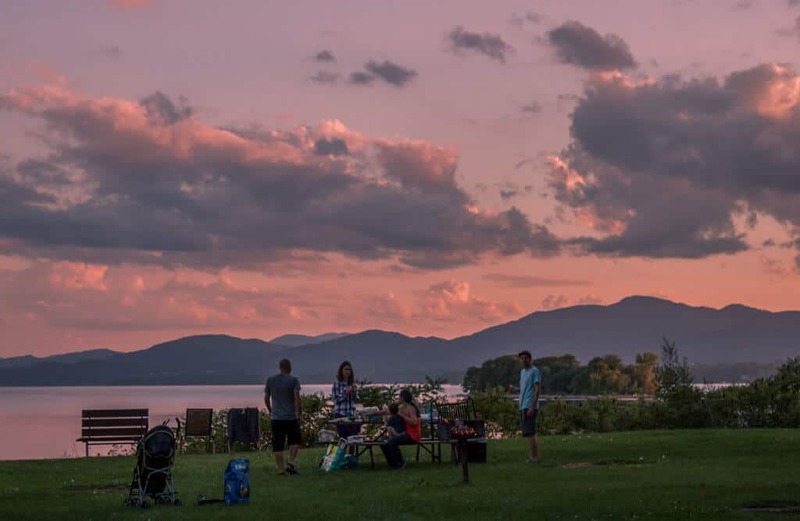 There are 13 Vermont State Parks on Lake Champlain, making it easy for campers, swimmers, hikers, and nature lovers to explore the lake’s waters and shores. During our last camping trip of the season, we had the good fortune to explore three fabulous state parks near Burlington, VT, all within easy driving distance of each other. Even short trips to Lake Champlain are enough to lower my blood pressure, and this trip was no exception. We spent hours hiking along the shore, taught our puppy to swim, bought seriously awesome maple creemees as we traveled between parks, and watched three amazing sunsets. 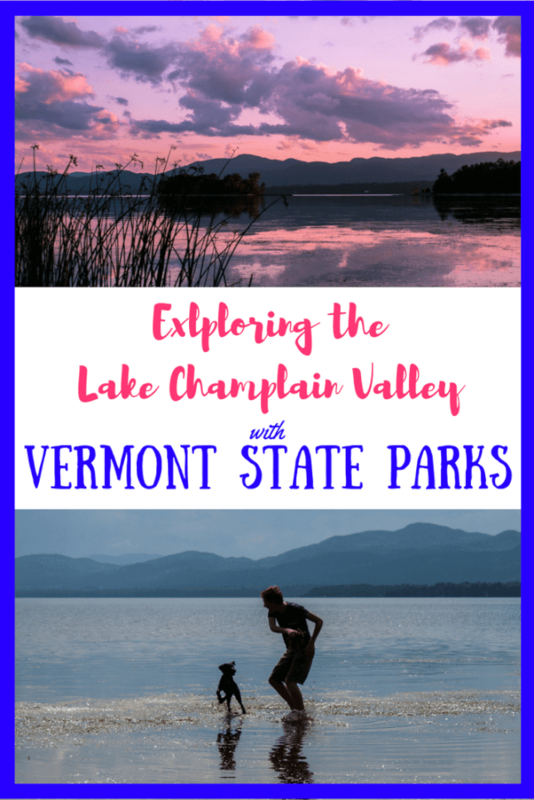 Here are some highlights from our fabulous Lake Champlain camping trip. 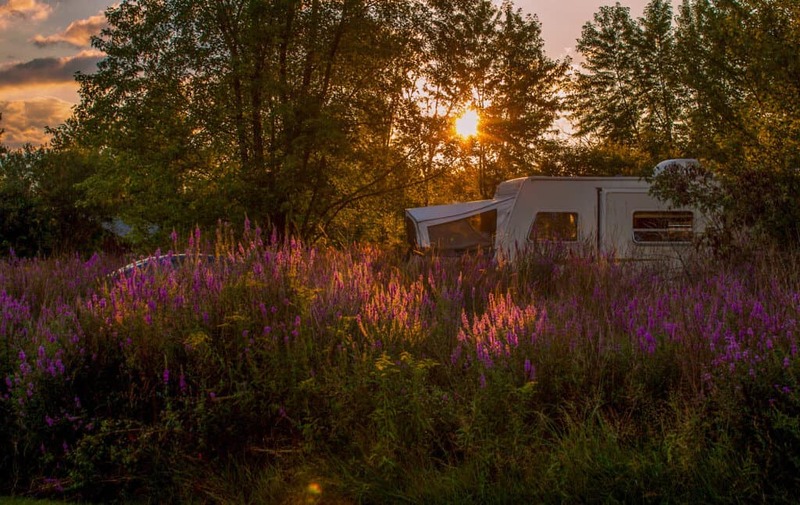 We’ve camped at lots of different Lake Champlain campgrounds over the years, but always in the fall, when the summer vacationers and mosquitoes thin out. This year, we camped at Button Bay State Park in Ferrisburg in August, which was quite different. Definitely more crowded, but with a really great family vibe. We tried to reserve our favorite lean-to, Willow, but it was booked when we called, so instead we snagged Cedar, a lovely, private lean-to site, just a short walk from the bathrooms and from the trail to the water. There are two campground loops in Button Bay State Park, each with their own bathhouse. The first loop consists mostly of lean-tos, with a few tent sites. Sites in this loop are private and offer a bit of shade. Between Catalpa and Willow, there’s a beautiful meadow trail down to the beach. This is called the dog walk, and our puppy definitely appreciated the walk and the beach on her visit. Button Bay State Park is dog friendly! The second loop is very open, and most of the sites are either in the middle or around the edge of a big field. This loop has a nice playground, a trail to the pool, and incredible lake and mountain views. Button Bay State Park also has four camping cabins, each with gorgeous, sweeping views of Lake Champlain and the Adirondack Mountains. We’ve been eyeing them for many years, in hopes to reserve one for a fall weekend, but they’ve always been booked. Tip: Don’t procrastinate! Not far from the Button Bay Campground is a trail out to Button Point. It’s a short hike, and takes you past a nature center nestled in the woods. Here you can find out more about Champ, Lake Champlain’s famous monster, and the button-like concretions that gave the park its name and are found along the rocky shoreline. The trail follows a service road for a bit, delves into a beautiful hardwood forest, and then pops out onto a rocky peninsula. It’s a great place to watch the sunset, take pictures of your puppy, or have a picnic! Button Bay State Park has a lovely pool to swim in, which is perfect for families with small children. For lake swimming near Burlington, I recommend driving to Kingsland Bay State Park, just 11 miles north of Button Bay. Kingsland Bay is only open for day-use, and it is absolutely perfect for a luxurious picnic, followed by a hike and a swim. The sprawling lawns are lightly shaded by stately locust trees. 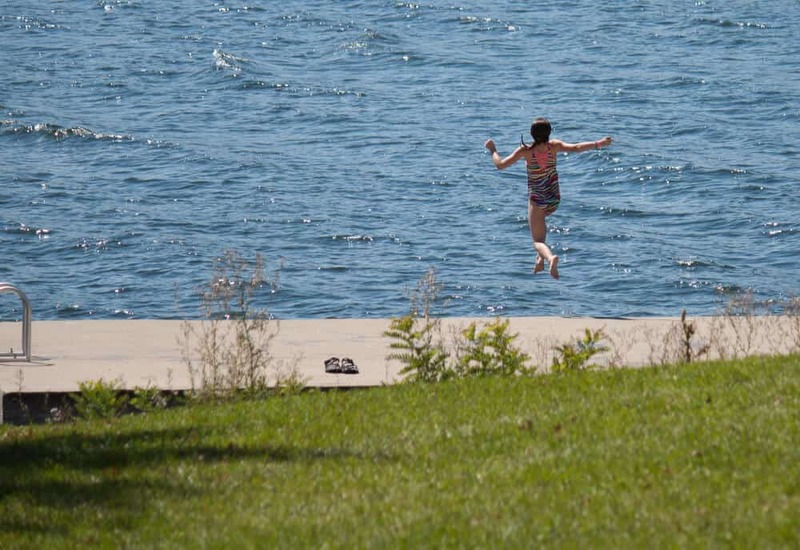 There’s ample room to spread out, and the water — well, it’s deep, clear, and refreshing — our favorite place to swim on Lake Champlain, and definitely one of our favorite state parks near Burlington, VT. The bay is nice and sheltered, and there are lots and lots of sailboats coming and going. 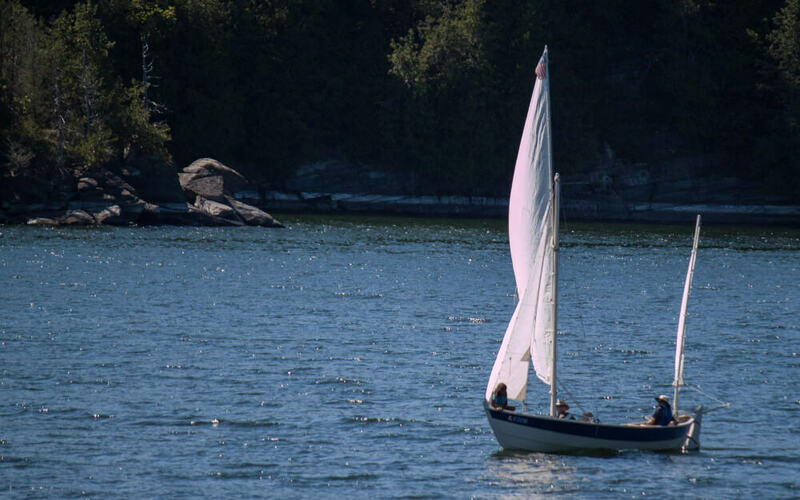 Is there anything better than watching those graceful sailboats as you relax on the shore of your favorite lake, all sleepy after a beautiful swim? I think not. One note about Kingsland Bay — while I find it perfect in every way, there isn’t much of a beach — just a dock for jumping off of. I probably wouldn’t bring toddlers here to swim, and dogs aren’t permitted either. What to do after the most relaxing summer day ever at Kingsland Bay State Park? 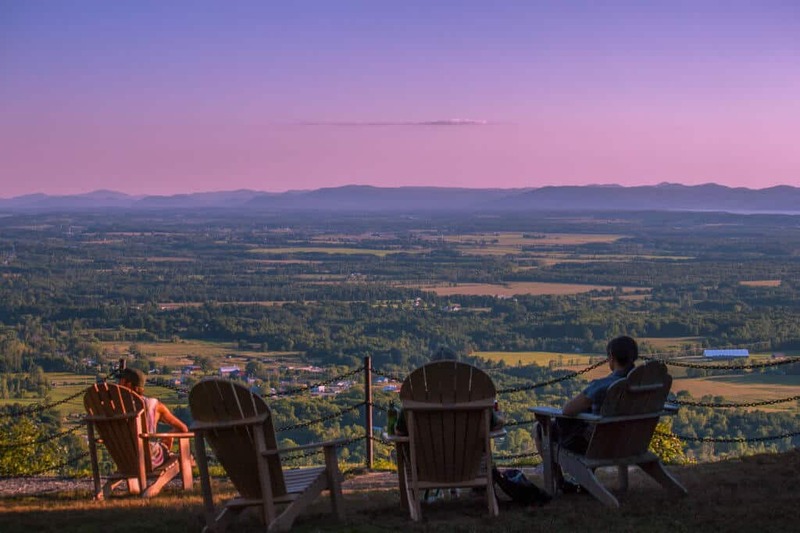 How about a taste of Vermont’s yummiest maple creemee, followed by a vigorous hike up Mt. Philo, followed by a super sunset? Okay, so I haven’t tried all of the creemees that Vermont has to offer, but Seven Days awarded the best creemee to Vermont Cookie Love (and Burlington Bay Market & Cafe) in 2016. 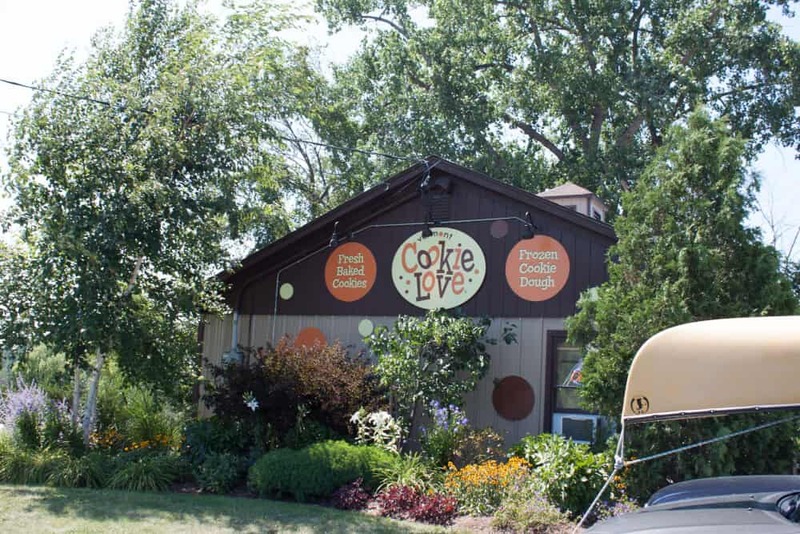 Lucky for us, Vermont Cookie Love is located right on route 7 between Kingsland Bay State Park and Mount Philo State Park. Can our weekend get any better? Mt. Philo is under 1,000 feet, and the trail to the top is just ¾ of a mile. Hiking not your thing? You can certainly drive to the top with your picnic and binoculars. Mt. Philo State Park is Vermont’s oldest — created way back in 1924. 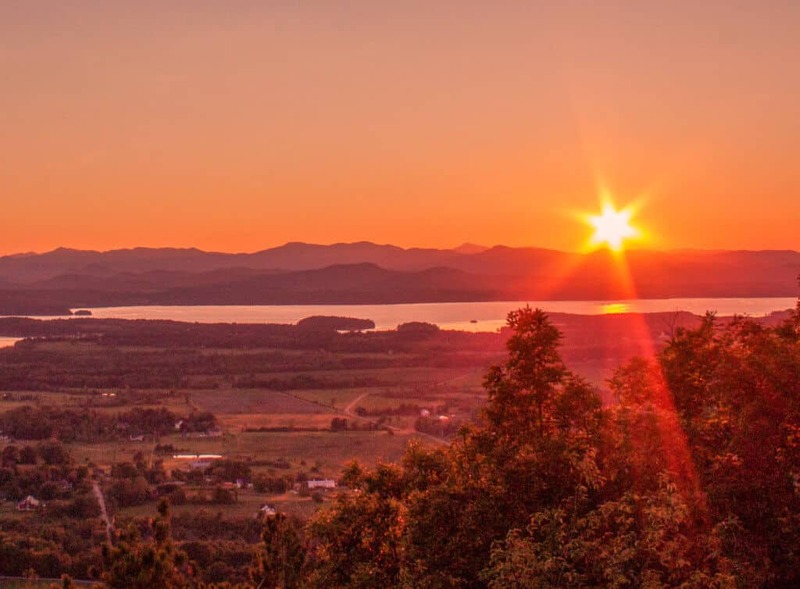 Whether you hike or drive to the top of the mountain, you’ll be rewarded with one of the prettiest views in all of Vermont! Mt. Philo State Park has one of the quaintest and smallest campgrounds near Burlington, VT. There are just 11 sites, and the day-use area closes just after sunset, making for a really quiet night on the mountain. We met some of our favorite people at the top to celebrate the end of another Vermont summer, and watched the sun go down with a handful of locals and visitors. We were all stunned into silence by the magic of that sunset, and the cool breeze that came with the twilight reminded us all that autumn was just a handful of sunsets away. Nothing beats a Lake Champlain sunset! Thank you so much to Vermont State Parks for helping me explore so many of Vermont’s natural treasures this year! I loved being able to capture my experience on camera and share so many of my adventures. I visited 22 parks this year, spent 35 nights under the stars, and took hundreds, maybe thousands, of photos. If you’re interested, I wrote a personal essay about my first foray into solo camping this summer for the Oboz Footwear blog. 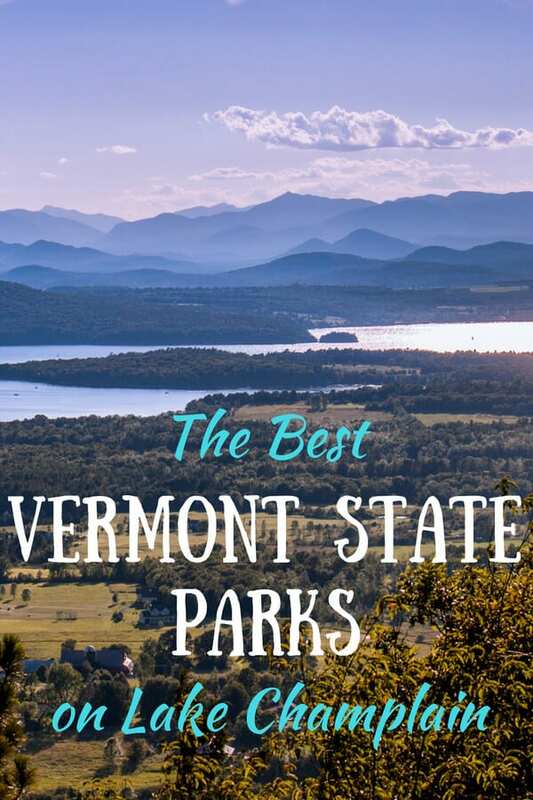 I had no idea what to expect when I saw “Vermont State Parks” – but now I know that they are absolutely beautiful and need to be added to our never ending list of places to go. Thanks so much for sharing – just shared on Flipboard and will save to Pinterest and G+ also! This was perfect!! Eerie how similar it is to my campground guides. Love it! Pinned it! This is fantastic. Am I gushing? 🙂 The detail is great and the whole post makes me miss Vermont so so so much. I love your sunset pictures! Vermont looks like a really beautiful area. I haven’t been yet, but I’d love to explore it more. There is so much of this country I still need to explore. Vermont looks beautiful. That sunset is incredible! The lake Champlain looks so ethereal. It would be great experience to sit by the lake and watch the sunrise with the water shimmering in the twilight. Looks like a stunning place, and great photos! I love places like this. The more I can spend time in nature with my family, the happier I get. You take the most expressive pictures Tara 🙂 They convey so much freedom and happiness. We definitely need to visit your neck of the woods next year. Cheers!